A woman holding a sign with a message that reads in Spanish, “Rich women have abortions, the poor ones die,” during a demonstration in front of the Argentine Embassy in Lima, Peru, Aug. 8, 2018 (AP photo by Rodrigo Abd). Earlier this month, Argentina’s Senate rejected a bill to decriminalize abortion by a vote of 38 to 31. The bill, which narrowly passed the lower Chamber of Deputies in June, would have legalized abortion up to 14 weeks. 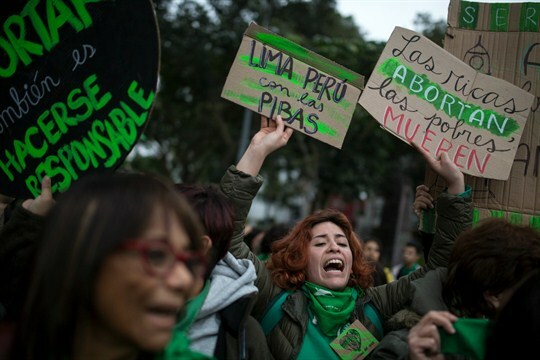 It was a disappointing, though perhaps not unexpected, outcome for the thousands of abortion rights activists who made up Argentina’s “green wave” demonstrations. Activists’ hopes were buoyed by recent successes in Chile in 2017 and Ireland in 2018, where restrictions on abortion were overturned. While a majority of Argentines reportedly supported the bill, Argentina’s #NiUnaMenos, or “not one less,” movement faced a strong counter-protest campaign supported by the Catholic Church and Pope Francis, the former archbishop of Buenos Aires, himself.